For the first time ever, Apple will let anyone test out its new iPhone software -- before it gets released to the general public. Only software developers now have access to iOS 9 to prepare their apps for Apple's latest mobile operating system. But next month, iOS 9 will go into "public beta," meaning anyone with an iPhone or iPad will be able to noodle around with iOS 9. That's a momentous step for Apple (AAPL), which has largely dragged its feet in allowing everyday customers to preview the latest features before they're ready. Apple is one of the few examples of a successful "walled garden," tech jargon for a company that doesn't let the public tinker with its code. It's the opposite of the "open" approach that made Microsoft (MSFT), Google (GOOGL) and Facebook (FB) three of the most successful tech companies in the world. Each has a customer base that far surpasses Apple's. However, Apple's sales last year eclipsed its three rivals combined. Apple is also easily the most profitable tech company on the planet. So why the shift in strategy? Apple is hardly going "open" in the classic definition. Its code is still a well-kept secret, and the only place you can use Apple software -- with the notable exception of iTunes -- is on an Apple device. Heck, you couldn't even watch Apple's Worldwide Developer's Conference on a PC on Monday. But opening up its beta software to the public is a smart, forward thinking move. It means that average Joes -- the people who actually buy iPhones -- can toy around with the software and offer Apple feedback. Putting the early version of iOS 9 into actual customers' hands means that Apple can effectively tweak and even overhaul its new software at an unprecedented rate. It means that Apple might just be able to avoid embarrassing mishaps of the past such as the iOS 6 battery drain problem and Maps' inability to recognize basic searches. With enough eyeballs, Apple might be able to catch those mistakes before they go live. In the 1990's and early 2000's, testing unfinished apps before they were publicly available used to be a nerd badge of honor. But today, we all beta-test software -- whether we realize it or not. Facebook doesn't even bother telling customers when it releases beta products. The social network constantly tinkers with its app and website, testing out changes on small groups of unwitting Facebook users. Microsoft, Google and Adobe (ADBE) have been releasing public beta versions of their products for years. Microsoft released Windows 10 in public beta an unprecedented 10 months before it is scheduled to be released, letting everyday users play with the new operating system for nearly a year. Gaming portal Steam allows developers to post beta versions of their games online to let people test them out. Electronic Arts (EA) and Microsoft have even gamers spend weekends playing pre-release versions of Xbox One games to test for online multiplayer bugs and glitches. Last year, Apple released OS X Yosemite for public beta -- the first time Apple released an early version of its Mac software to average customers. That was big news for Apple -- but the number of people who use Macs is a small fraction of the hundreds of millions who carry around iPhones and iPads every day. 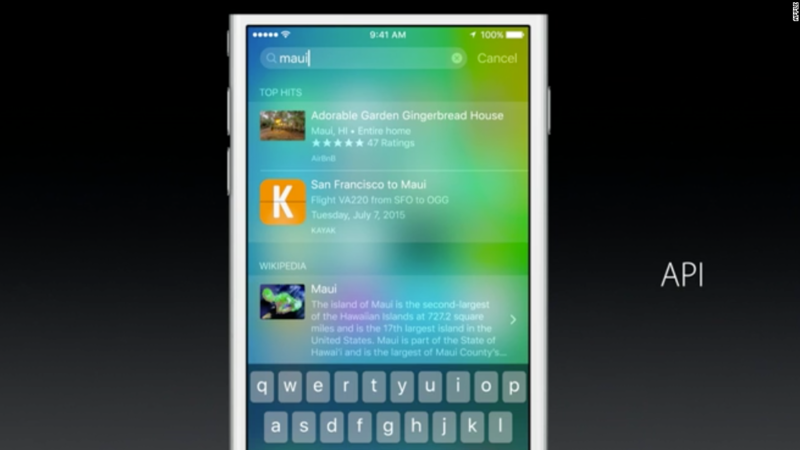 By giving average customers early access, iOS 9 will be better as a result.